Whether you’re looking to add some interest to a blank wall, or want a fun piece of art to hang in your craft room, we’ve got the perfect tutorial for you. With a simple but clever paper folding technique to create the impression of it being three-dimensional, this make is going to give any room the wow factor. Bursting with colour, our 3D wall art is guaranteed to grab the attention of anyone walking into your room and will add a fun touch to any décor! Follow Angel’s step-by-step below and enjoy creating your own! 1. Start by taking a sheet of coloured cardstock. Score it once down the centre widthways. 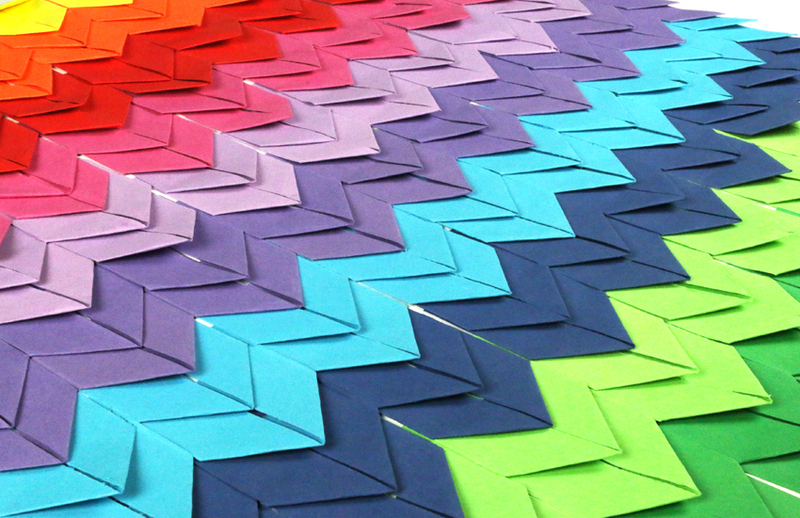 Then, fold your paper in half lengthways, and then twice again so that you have 16 rectangles on your sheet. 2. Cut along all of your score/fold lines so that you are left with sixteen strips of card with scissors or a paper trimmer. 3. Take one strip of card and fold it in half. 4. Fold one half of the card upwards as shown below. 5. Repeat with the other half of the strip of card. 6. Turn your piece of card over and apply double-sided tape to it as shown below. 7. Repeat with a variety of colours until you have enough paper slips to cover your canvas in your desired pattern. We used ten and a half strips of paper per row but you might need to adjust this depending on your canvas size. 8. Begin to adhere these to your canvas, making sure that you carefully line them up in order to create the desired effect. Continue until you’ve covered the entire canvas. Your wall art is now complete! The pattern that you’re left with almost gives the impression of an optical illusion – it looks SO effective to say that it was super easy to create. We can’t wait to get this hung up in our craft room! Will you be giving this colourful make a try? We can’t wait to see your versions of this make – don’t forget to #Trimcraft when to social media and to share your projects in the Inspiration area.